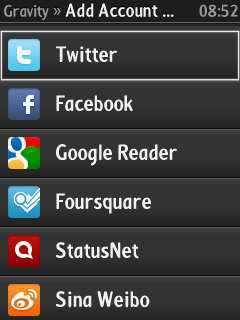 Gravity is the first fully-featured and native Twitter client for the S60 platform. It supports multiple accounts, Twitter ,Facebook,Google Reader,Foursquare,Laconica,Ping.fm, posting of pictures via MobyPicture & TwitPic and wraps everything into a gorgeous looking interface. I really like your post its very unique from other mobile posts.